Located in the centre of an Area of Outstanding Natural Beauty, you know Fowey is going to be truly picturesque. This small town is based at the mouth of the River Fowey, featuring quaint cobbled streets and sweet cottages. A natural harbour; Fowey is home to many yachts, fishing crafts and pleasure boats and there are frequent ferries to Polruan and Bodinnick. A mix of winding streets and glorious beaches, St Ives has a Mediterranean style feel to it. Clustered around the harbour are fisherman’s cottages and terraced cafes, and there’s an eighteenth century pier nearby too. Once a busy fishing port, this town relies on tourism so has plenty to offer including the Tate Gallery. Experience the understated charm of Penzance which is located looking out of Mount’s Bay and St Michael’s Mount. It’s the main commercial hub near Land’s End and has shops, pubs, galleries and a weekly farmer’s market. The working harbour is another interest attraction, where ferries depart for trips to the Isles of Scilly. Incredible coastal scenes, beautiful sands and a vibrant nightlife are all on offer in Newquay – Cornwall’s number one holiday destination, particularly with the young. It attracts thousands of visitors here every summer, so can be packed. Surfing is another main attraction as well as family-favourite Newquay Zoo. The only city in Cornwall, Truro is known for its grand Cathedral with gothic-inspired spires as well as its brilliant shopping hub and pedestrian friendly centre. If you like a spot of retail therapy, you’ll find everything you need from major chains to independent boutiques. The Royal Cornwall Museum is another interesting highlight which contains archaeological finds from across the county. This harbour town was built by Henry VIII when he built Pendennis Castle. It first became a booming tourist top in the 19 century but has continued to flourish ever since, with a modern university making it youth friendly. It has quaint cobbled streets and lots of fine sands to wander. There are plenty of café, bars and old pubs to enjoy too. Tourism arrived in Padstow in 1899 when the nearby railways opened. It is a popular port located between Hayle and Devon, known for its excellent eateries and fresh seafood. It also has possibly the best cycling route in Cornwall, named The Camel Trail, which links Padstow with Wadebridge. Located on both side of the River Looe, this town is joined by a 19th century bridge. 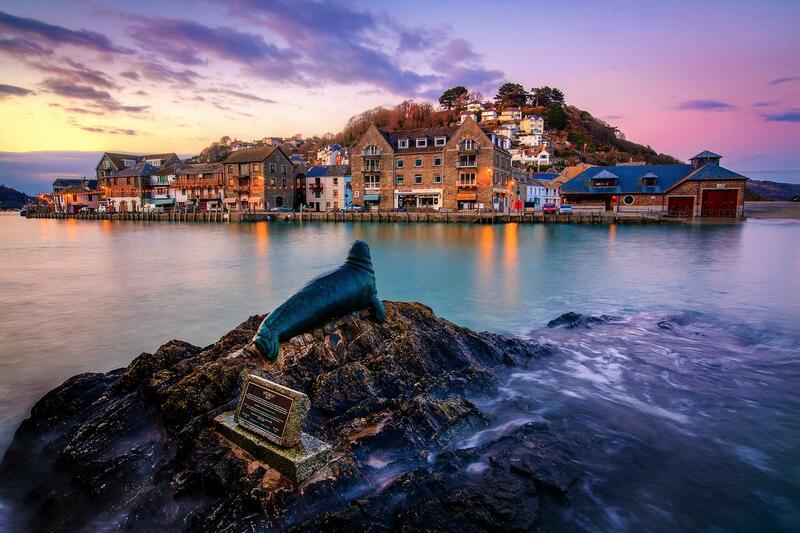 In East Looe you’ll find the working harbour and town’s main shopping facilities. In West Looe you’ll come across hotels, restaurants and a quieter setting. If you want to watch local fishermen at work sit back on the Banjo Pier, plus make sure you visit Hannafore Beach for views to Looe Island.